The use of engineered wood sheathing has grown dramatically in residential construction over the past 30 years. 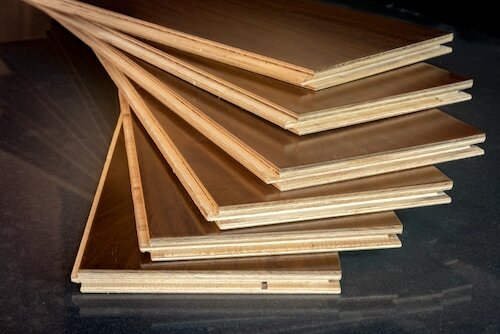 Engineered wood products are often used for sheathing in residential construction on roofs, floors and walls. Technically, engineered wood is any wood product that is not solid wood. Producers of wood panel products like to call plywood the first engineered product. Plywood consists of thin veneers of wood that are stacked so that the grain of one layer, or ply, runs perpendicular to the plies above and below it. An adhesive is applied between the plies and they’re bonded together on a hot press. In the early 1980s, producers created technology to take the plywood concept a step further. Rather than bond together thin veneers of wood, the new process allowed for the bonding together of small pieces, or strands, of wood. Called oriented strand board (OSB), the panels are cross-laminated, like plywood, and bonded together under intense pressure. Most panels have a nonskid surface on one side. As with a plywood panel, an OSB panel's strength runs in both directions because of the cross lamination. OSB makes better use of natural resources. It can be manufactured using smaller, faster-growing trees rather than those from old-growth forests. It's cheaper than plywood, which is one of the reasons builders like it. It can be produced in larger sheets than plywood. Unlike some plywood, OSB does not contain interior voids. They offer the advantage of consistent quality from panel to panel. Building codes recognize the use of OSB. The Engineered Wood Association (formerly known as the American Plywood Association or APA) developed a set of performance standards for engineered wood sheathing. Under the program, panels are rated for single-layered flooring, exterior siding, and sheathing for floors, roofs and walls. The panels must meet requirements for dimensional stability, bond adhesion, and structural strength, among other things. The APA stamp on the panels identifies the end use of the panel. It also provides the span ratings for different products. For example, a product that can be used as subflooring or as sheathing for a roof may carry the designation 24/16. In this case, the left-hand number represents the maximum allowable span in inches between end supports when the product is used as roof sheathing. The right-hand number is the span rating for subflooring. The stamp also tells if the panel is designed to withstand the effects of repeated wetting and drying, called "Exterior." "Exposure 1" panels are more suited to uses that are not exposed to the weather, such as subflooring. The thickness of the panel is also listed on the stamp. Manufacturers will provide the nailing schedule for their products. For roof sheathing, the panels are generally installed using 2½-inch common 8d nails. The nails should be placed 6 inches on center on end supports, and 12 inches on center at intermediate framing. Because OSB is very dry when it leaves the factory, some swelling can be expected as the panels absorb moisture from humidity. To account for this, most manufacturers recommend leaving an 1/8-inch gap between panels. Standard panels are 4x8 feet. As with plywood, it is important to support the panel when cutting it to size. On the job site, builders usually cut panels using circular saws equipped with a plywood/OSB blade. These blades have more and finer teeth than the typical framing or ripping blade and produce a finer, cleaner cut than the framing blade. Engineered wood sheathing’s industrial durability makes it a standard for building purposes. Use these tips to ensure a quality finish whenever you’re working with it. Fran Donegan writes home- and garden-related content for numerous digital and print publications. He is the author of the books “Pools and Spas” and “Paint Your Home.” To see a wide selection of the kinds of circular saws and blades needed for projects like these, check out the Home Depot website.